MIAMI — It's the story student journalists at Marjory Stoneman Douglas won't ever forget — the massacre at their high school in Parkland, Florida, which claimed 17 lives. Now they've channeled their grief through journalism, offering the world a closer glimpse at the lives lost through a commemorative edition of the student newspaper paid for entirely with charitable donations. The edition, published earlier this month, is a special issue, which profiles each of the victims lost in the mass shooting: 14 students and three school employees. A GoFundMe campaign created the day of the shooting that has raised nearly $50,000 was intended to cover the cost of producing a 40-page commemorative edition, but that money will instead be used to establish a fund to support the school's journalism program. Many of the students on the staff of the Eagle Eye, the high school newspaper, were forced to juggle being a reporter with being a survivor suffering trauma and grief. When the shooting took place on Feb. 14, several staffers hid in the photo closet of the newspaper room with their faculty adviser, Melissa Falkowski. "I wasn't emotionally prepared to go back into that closet," Emma Dowd, co-editor in chief, said during a panel discussion March 23 at the Newseum in Washington. "I didn't feel that I was emotionally able to go into the school to even retrieve a camera." But with the events of Feb. 14 receding, however slowly, she and her colleagues are gathering dozens of photos, quotes and tributes for the latest edition of the newspaper. "It's very hard to cover tragedy, and sometimes you have to talk about your own emotions," said Rebecca Schneid, the other co-editor in chief. "No other publication knows Parkland like we know Parkland." 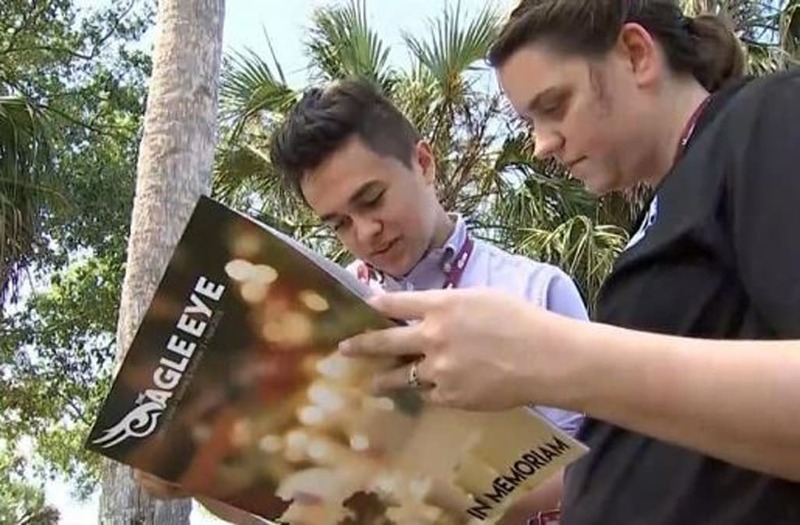 Several of the students at the Eagle Eye knew or had classes with those who were killed. "I probably saw her a few times, but I never even knew her name," Nikhita Nookala said of Meadow Pollack, the fellow student she profiled. "That was the hardest part because when I was doing her profile I saw that we had so many things in common. We would get along if I knew her." Student journalists started working on the edition immediately after the shooting, with a handful taking on reporting assignments that took them to vigils, funerals and the March for Our Lives rally in Washington. "A lot's been said about students we've seen on TV," said Falkowski. "But this issue will be a testament to these students' love of their community. It shows the world their talents."